We did a pinweaving workshop one afternoon at Embroidery Guild. 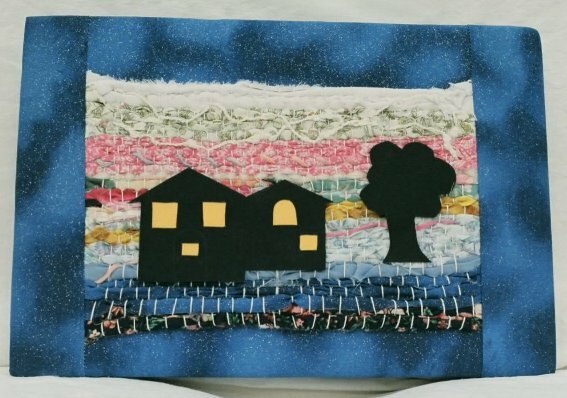 I made a rectangle with sunset-ish colours and then began to see paper silhouettes of a building and tree, rather like a poster I have. I had to make it up like that. 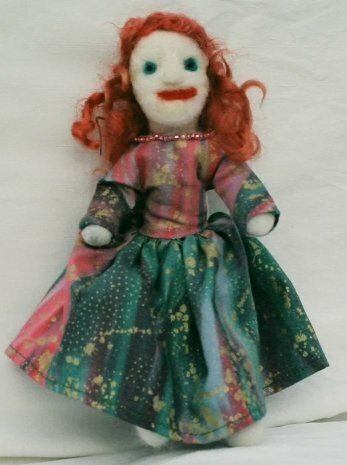 A doll felted onto a wire armature. This was just an exercise in needlefelting. I wanted to see what I could do. Clearly, I need more practice in faces! 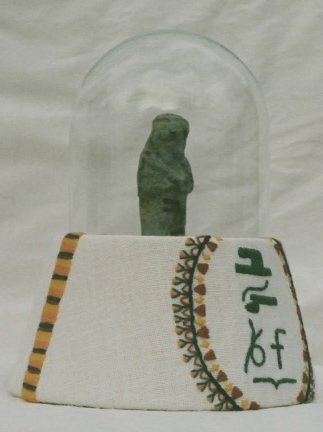 My husband gave me this Egyptian statuette which I wanted to display, but the bottom of the statue was not flat. I conceived the idea of making a custom holder for it. I dug out a custom-made hole in acid-free card and covered it with natural cotton fabric. Of course, I had to embroider a cover! 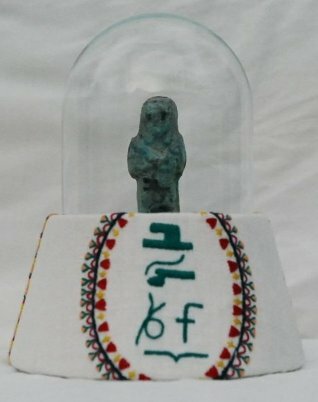 I copied the symbols written on the back of the statue and used some geometric motifs which seemed to be typical of Egyptian carvings and paintings. A glass cover slips into the holder. My daughter came home one weekend with this purse as an idea in her head. We worked together and she went home on Sunday with the actual purse! OK - this isn't my work but I really liked it and I did help. I guess my daughter was an inspiration. 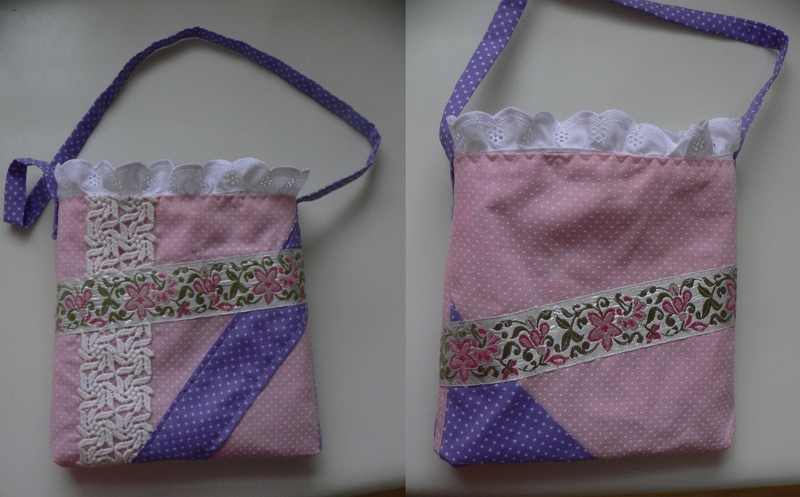 I made these three small purses for the church bazaar in 2008. They were made entirely with fabrics and trims from my Mom's stash. I thought they were quite cute. Oh! I see my daughter and I both chose the same white fabric with coloured polka-dots. I was looking for something fun for a Stag & Doe fundraiser in 2009. 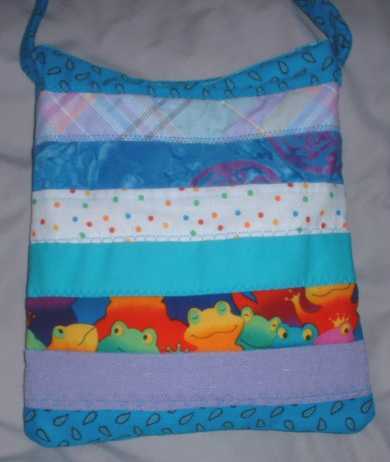 Someone suggested bra purses and I did a little internet surfing and found that bras covered with bits and pieces made very cute, small purses. So, I dove into my lace stash and put together 3 of them. I made up, and smocked, 2 little sundresses like this for a pair of flower girls. These were also made with trims from my stash. 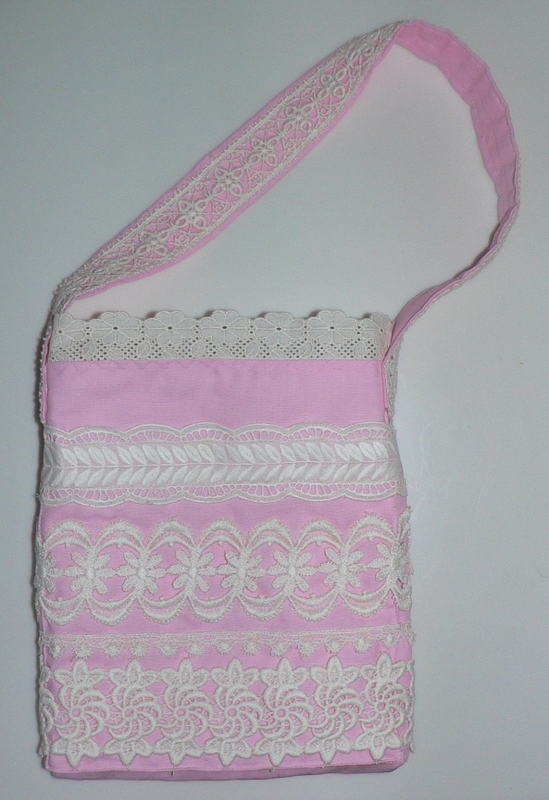 I dyed some of the lace for the purple flowers on the pink purse. 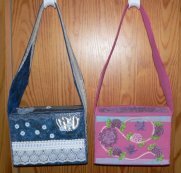 The two purses are made from the same pattern. I made a removeable insert with pockets for a phone, etc. 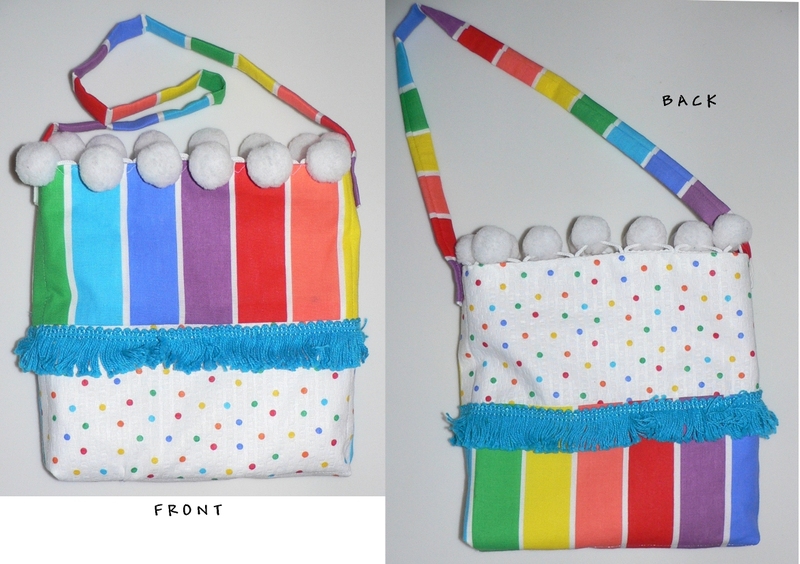 The idea is that you can change your purse in a flash by simply transferring the insert from one purse to the other. These were donated to a fund-raising auction in May 2010.